When viewed in a long perspective, the modern history of popular music has very often been one in which new styles are adopted by the young in spite of (and indeed because of) the incomprehension and disapproval of their elders, only to enter the mainstream as those young people age. At the same time, Christians, when confronted with the arts of the societies in which they find themselves, have variously ignored, embraced, adapted and tried to replace or eradicate those arts both in worship and in public. It is in these two ongoing stories (in their American variant) that Randall J. Stephens makes a timely and important intervention. It will be required reading for students of modern American cultural history, but specialists in the religious history of other countries will also find much of value in it, as will the growing number of theologians and musicians concerned with the relationship between the churches and the arts. No serious academic library will want to be without it, and since it is generously produced and sensibly priced, it should find a wide readership outside the academy amongst Christians and ageing rock fans alike. Stephens’ argument is relatively easily summarised, although the introduction to the book does not do so adequately. Chapter one shows the close linking between the early development of rock and roll and the music of the Pentecostal churches, such that (although some Christian critics did not care to admit it), the stylistic differences between music inside and outside some churches were small, even if the lyrics were very different indeed. Striking here is the relationship between the Pentecostal televangelist Jimmy Lee Swaggart and Jerry Lee Lewis, his cousin, but similar debts of influence were owed by James Brown, Little Richard, Johnny Cash and indeed Elvis himself. Stephens’ exploration of the agonies of conscience that some suffered as a result of the disapproval of their own churches is vivid and convincing. Chapter two describes a short but intense period of concern, not to say panic, over the dangers of rock and roll in the years before 1958, followed by a period of relative calm as several of the stars either died or were kept out of trouble in the armed forces. Stephens evokes the cluster of interrelated concerns in play: of the impact of ‘savage’ music (the possession of a subjugated culture) on white America; a more general anxiety about the young in an increasingly affluent and consumerist context, and their apparent slipping out of the control of their elders; there are overtones too of the fear of Communist infiltration. This is all deftly done, but it would have been useful to examine more closely the degree to which these concerns were distinctively religious (or, the prerogative of religious people), as opposed to those of a particular race, class and generation. After this period of calm, chapter three then shows the remarkable storm of dispute with which the Beatles were met after John Lennon’s famous comment to the London Evening Standard in 1966 that the Beatles were ‘more popular than Jesus now’. Though Stephens is not quite right in saying that the comments made little impression among British Christians, the protests were of a quite different order in the USA: radio stations ceased playing their records, death threats were made, and effigies of the band burned in Dixie. Chapter four and five, taken together, deal with the central paradox of the story: from the late 1960s onwards, how did part of the evangelical constituency come to see that these forms of popular music were not passing phenomena and as such were to be reckoned with, and perhaps used, rather than simply rejected? Stephens is vivid on the interconnection between the new ‘Jesus rock’ and an ongoing Christian negotiation with the wider counter-culture of the period, as Billy Graham, previously an opponent, grasped the need for a different approach to the extent that for a time he wore his hair long. For proponents of Christian rock then and since, it was possible to adopt an artistic form while changing its content; medium and message were separable. At this point Stephens’ book intersects with other recent work on the subject, notably that of David W. Stowe, and it appears at almost the same time as a new biography of the Christian musician Larry Norman, by Gregory Alan Thornbury. Chapter five documents the backlash amongst other Christians, which Stephens calls the ‘fundamentalist reaction’. For these preachers and moralists, the proponents of Christian rock were variously too effeminate, too emotional, their stage acts too sexualised, and too closely associated with the charismatic movement. More often, though, the issue at stake was one of genre: rock, because of the associations it carried, could never be turned to a positive use and had to be shunned. Nonetheless, as Stephens’ story ends in the years after the millennium, Christian rock had become ubiquitous in American churches of an evangelical kind, with the remaining redoubts against it becoming fewer, and crossover artists had achieved mainstream recording and touring success. All of this is wholly convincing as a characterisation of the period and as a chronology. This reviewer would wish, however, to make some criticisms on grounds of method and analysis, not so much to contradict the argument as to draw out and make explicit some things that are latent in it but which Stephens does not spell out. Stephens’ method is documentary rather than narrowly analytical, which has both advantages and disadvantages. Having unearthed a vast, teeming field of Christian voices arguing about rock and roll, Stephens’ evocation of this cacophony is brilliant; his ear for the cadences of the preacher and the moralist is acute, and his ventriloquising of their concerns rings true throughout. Just occasionally the style becomes overripe, however; preachers ‘thunder’ and ‘howl’ in ‘raging fires’ of controversy but rarely just speak; guitars blast and drums thump but rarely do musicians just play or sing. In short bursts, the heightened register that Stephens adopts is vivid and evocative; over the length of a whole book it becomes somewhat wearing. It is also the case that quite often the argumentative thread is lost amongst the clamour of voices, and there is a tendency to repetition, as the same themes recur again and again; we hear about the length of Billy Graham’s hair at least four times. Some of the impression of repetition could have been avoided had Stephens included a more precise analytical framework in which to work, into which his narrative could have fitted well. The first such structure that is missing is a musicological one. The music here is ‘driving’, ‘revved-up’, ‘blasting’ or (in the case of the Christian metal band Stryper) ‘schlocky’, but to really apprehend what is at stake this reader at least needed a clearer sense of genre, instrumentation, performance practice, melodic and harmonic structure and so on. To borrow a quotation often attributed to Elvis Costello amongst others, writing about music is like dancing about architecture: exceptionally difficult to do well, but here the reader needed more nonetheless. As it is, readers without Stephens’ prodigious knowledge of this music are left with a great deal of work to do. The second area in which the book would have benefitted from a clearer analytical framework is in the definition of different strands of Christian opinion. There are here pentecostal voices, Southern Baptists, Roman Catholics: denominational divisions that are reasonably robust as analytical categories. But Stephens never quite defines the differences between those who are ‘evangelical’, ‘fundamentalist’ and merely ‘conservative’. The term ‘fundamentalist’ is particularly difficult to define, and Stephens only meets the task head on in chapter six. ‘Fundamentalism’ has often been defined in strictly doctrinal terms, particularly concerning the authority of the Bible; the virgin birth, nature and eventual return of Christ; and the doctrine of the atonement. Defined in this way, several of those within the Christian rock movement appeared very ‘fundamentalist’ in their views of the Bible and on the issues that tended to trouble those with a conservative view of Biblical authority, such as gender, sexuality, and creationism. Stephens instead defines fundamentalism in terms of a determination to separate the faithful from the culture around them. This is clearly what is happening amongst some Christians during the period, but even if such cultural separatism was a marker of those Christians who were ‘fundamentalist’ in doctrine, it is not at all clear that they were the only Christians who took such a view of culture. On its own, cultural separatism seems insufficient as a definition of the term. And it is the theologies of culture in play here, the guiding principles that underlie the rhetoric, that are often submerged in Stephens’ account and that most needed to be named and analysed. From time to time they briefly break the surface only for the reader to be swept downstream in the chronological and rhetorical flow. Christians have historically taken the arts seriously for two main reasons. The incarnational sense that all human creative endeavour was a sharing in the creative work of God was the key element in the Catholic recovery of the modern arts in the 20th century. Stephens notes in several places the pervasive sense amongst secular critics that Christian rock was more often than not mediocre, a poorly executed example of an art form. This ( at least in the British context) was also the objection raised by Christian critics of ‘church pop’ in the 1950s and 1960s; if there were Christian voices in the USA making the same point, it would have added to the narrative to hear more of them. However, this incarnational understanding of the arts has historically been a minor theme at best in evangelical thought, with many being prepared to embrace bad taste in the service of the gospel. Evangelicals have been more interested in how the arts can be made to communicate a message, and (correspondingly) most exercised by the particular dangers posed if the arts were made to carry the wrong kind of message. The phenomenon of Jesus rock, far from being an anomaly, is part of a long tradition of evangelical efforts to adopt an artistic style for use in worship and/or evangelism while rendering it safe by supplying appropriate words, performed by those whose personal lives met the required moral standard. The insistence that a certain style of music – a certain arrangement of sounds in time, produced by a certain combination of instruments – could never be sanctified; that an element in God’s creation could never be redeemed for His use, is only one of the several theological options available to evangelical Christians, and has been the option least often chosen in evangelical history at large. All this is implied in Stephens’ account but only comes into focus in chapter six; it would perhaps have added to the impact had it been placed front and centre, earlier in the book. To reiterate, none of these criticisms is fundamental to Stephens’ argument, and to adopt a more analytical structure and style may have lessened the significant media attention which the book is attracting at the time of writing, which it deserves. 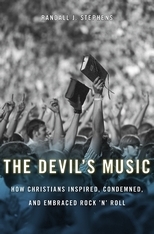 That said, although The Devil’s Music is a timely and important book, it leaves the reader with some work to do.